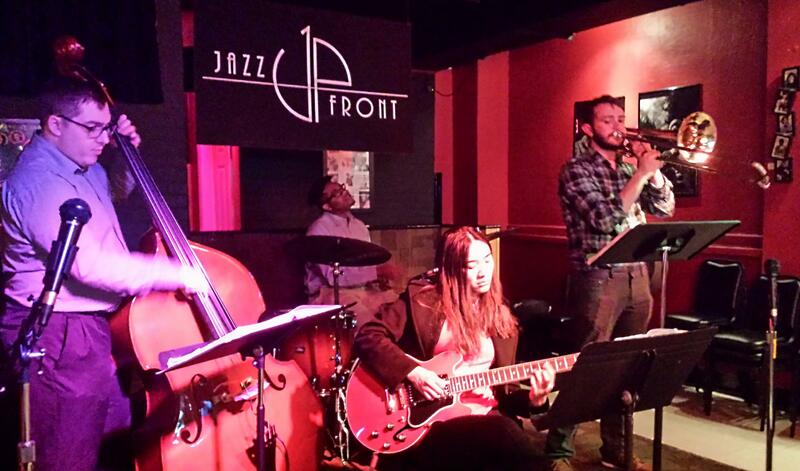 Chow 4-Piece (left to right) at Jazz UpFront April 5: Sam Tedeschi, Seve Bomar, Stephanie Chow, Mason Riedel. Not pictured: Joe Tiemann and Clinton Linkmeyer. Chow 4-Piece at Jazz UpFront in Bloomington April 5. 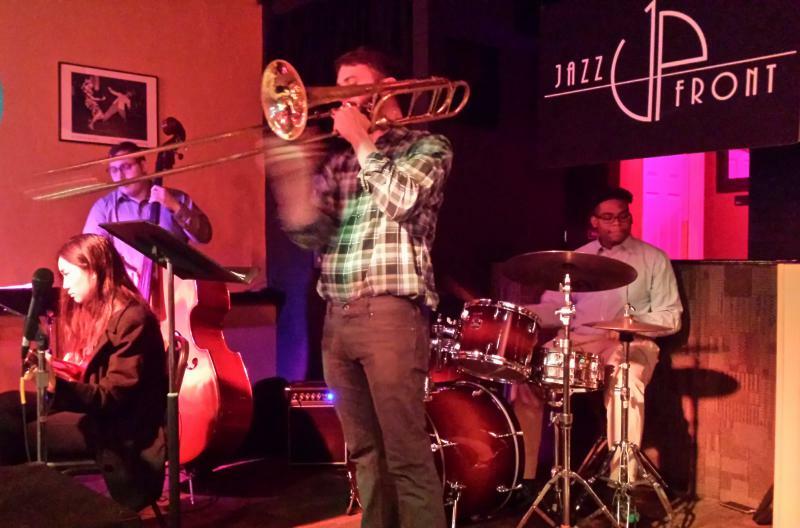 Trombonist Mason Riedel laughed when asked how his Illinois State University Jazz Combo acquired its name. 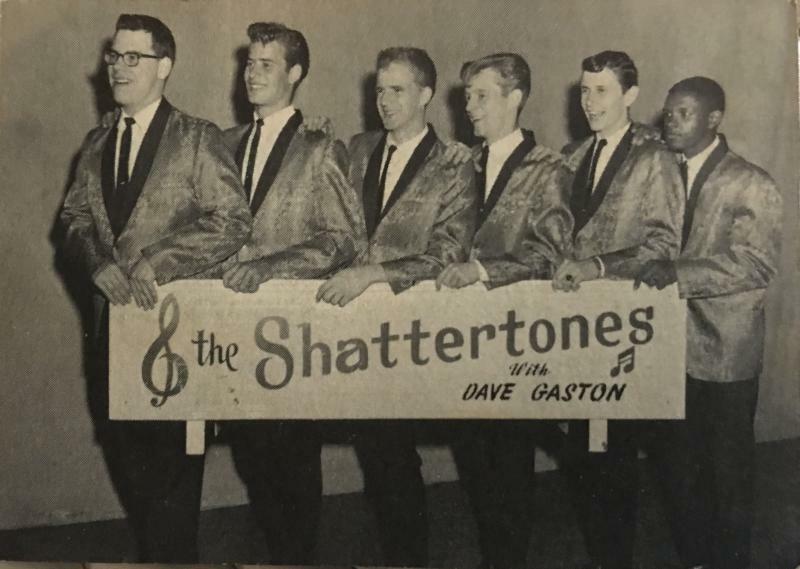 He had just been called by Jazz Up Front owner James Gaston about filling in last minute on a Thursday night. Stephanie Chow is the group’s guitarist. Chow 4-Piece returns to Bloomington’s downtown jazz club April 12. Fellow trombonist Joe Tiemann, a veteran of the lively Tampa, Florida jazz scene was thrilled when he learned a real jazz club was operating in central Illinois. Tiemann moved to the Twin Cities to study jazz at ISU after earning a Master’s degree in classical trombone performance from the University of South Florida. He said ISU Jazz director Tom Marko is helping him adapt to the improvisational nature of jazz. So how do you find your own voice in an improvisational music by transcribing solo’s done decades ago? Tiemann said you take what you already know and adapt it to your sound. “If you listen across a lot of different albums, a lot of times they (Johnson, Fuller, Marsalis etc) pulled from the same stuff. If you listen to guys like Jim Pugh who teaches over at the University of Illinois, he can play Carl Fontana better than Carl Fontana played,” said Tiemann. But is he then still Jim Pugh? “Oh yeah, he puts his own spin on it. And I put my own spin on things too. It’s learning the vocabulary. It’s like a classical musician listening to great classical players to hear how they are phrasing something,” said Tiemann. “Transcribing other people’s solos in my mind is comparable to using a Bach piano learning piece, like a prelude or something similar. You’re taking a melody someone chose to use and you’re kind of mixing it into your choice of sounds, melodies and patterns,” said Riedel. Riedell is also a grad student hoping to parlay his studies into teaching at the university level. And despite the seemingly annual pronouncement that jazz is dead, he’s optimistic even beyond the classic big band and combo lineup. “There’s a lot of jazz fusion and even jazz revitalization right now,” said Riedel. He said a current trend is brass band music. “There’s a couple popular bands. Lucky Chops is one that’s coming up. Their arrangement is trumpet, tenor saxophone, baritone sax, trombone, tuba and drum set. There’s another one called No B.S. Brass Band from Richmond, Virginia also making the climb and have become very popular.” Said Riedel. Tiemann added that newer jazz bands aren’t sticking to the sounds of Tommy Dorsey or Miles Davis, though Davis was a jazz trailblazer his entire life. 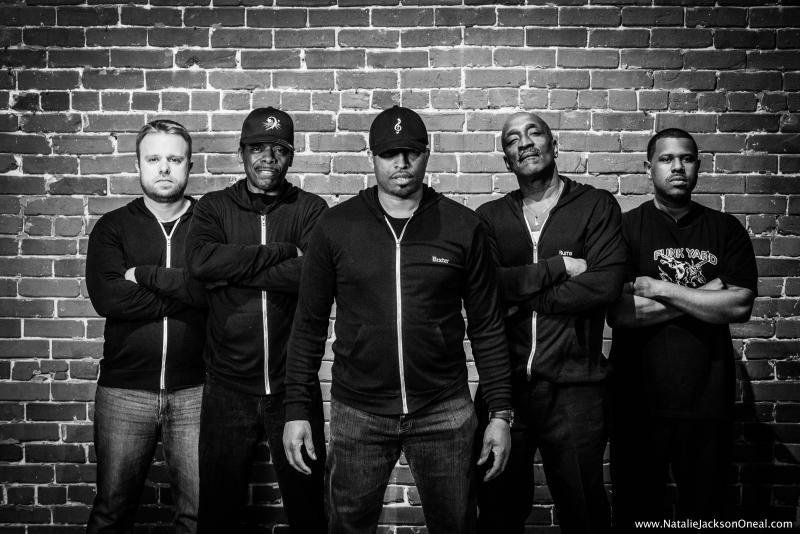 All six members of Chow 4-Piece will share the stage in some form beginning at 7:00 p.m. April 12 at Jazz Up Front. In addition to Tiemann, Riedel, and Chow, the combo includes bassist Sam Tedeschi, drummer Steve Bomar, and trumpet player Clinton Linkmeyer. Listen to an excerpt of the GLT interview with Mason Riedel and Joe Tiemann. Listen to the entire interview with Mason Riedel and Joe Tiemann of Chow 4-Piece and GLT's Jon Norton. 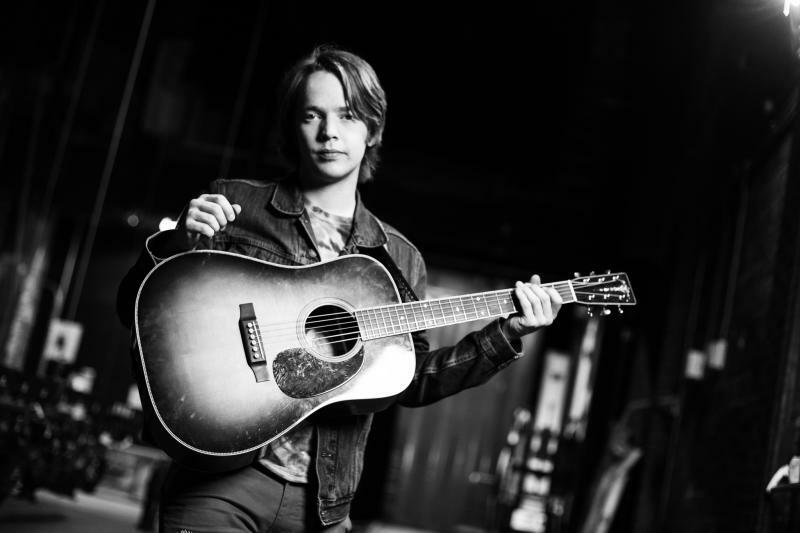 Billy Apostol was dubbed "Billy Strings" by his mother for his prowess on a number of stringed instruments at a young age. Tom Becker graduated from Stanford (IL) High School. That alone will date him.